The CoffeeShop Blog: CoffeeShop "Quilt Board #4" Photographer Storyboard! CoffeeShop "Quilt Board #4" Photographer Storyboard! Today I have a brand new quilt board. This is a 12x12 layered psd file so you can add your images using clipping masks (tutorial and free action). All of the colors can be easily changed to match your own images. 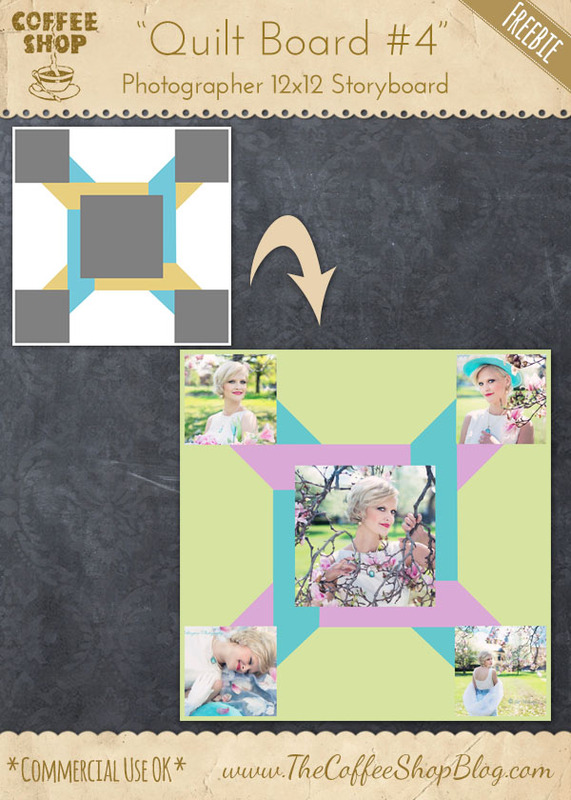 You could even add patterned digital paper for the background or borders. Just group them to each layer. This would be lovely printed or posted on the web. If you want to grab my other Quilt Boards, you can see them all on this page or on this page. I wanted to thank Jill Wellington (Etsy Shop, Facebook, Blog, YouTube Videos, Pixabay) for allowing me to use her gorgeous "Vintage Val" images in my example above. Download the CoffeeShop "Quilt Board #4". You can also download it here.